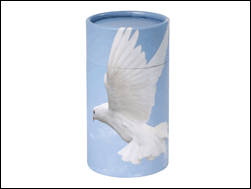 Choose from a beautiful selection of small urns. Below you can see our choice of urns for babies, children and teenagers. We are here to help you and so do feel you can contact us if you need help or guidance. You can call us on 01453 767769. You can also see our range of child and baby coffins. Cardboard tubes for keeping, burying or scattering remains.There is a perforate disc that can be removed and allow the ashes to flow out. These cardboard tubes are biodegradable, meaning you can choose to bury the tube. Pouch urns can be used to scatter ashes, or float for a few minutes on the surface of some deep water before gracefully sinking out of sight, where they will easily return to nature. 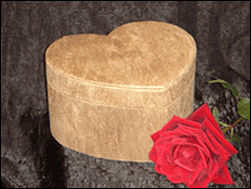 Heart urns can be used as a container for ashes or as a small coffin. Each comes with a biodegradable bag so the container can be buried. These urns are made from recycled, earth friendly, biodegradable materials. 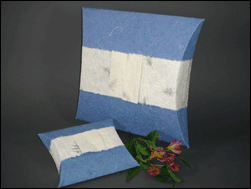 These are handmade from natural and sustainably harvested materials. 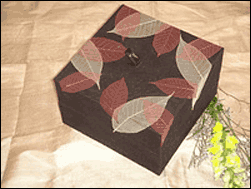 These beautiful box caskets can be used to scatter or bury cremated remains.